We take for granted our ability to text, tweet, Instagram, Snapchat, and email at a moment’s notice. Our hyper-connectedness seems altogether natural, but it wasn’t THAT long ago that we were unable to communicate, share, reach out, or ask for help….even when we really needed to do so. I’m writing this on an airplane, returning from Kansas City where I gave a presentation at a digital storytelling conference, amidst a local populace fully frenzied about the Royals’ first World Series appearance since 1985. Being in KC at this time, and speaking at such a profoundly modern event, made me recall the autumn of 2001 and the last time I attended a World Series game – much of which I spent in handcuffs. And so I share with you that story, which I’ve heretofore never written down or discussed publicly. 2001 was a most unusual World Series, on many levels. It was just weeks after 9/11, and emotions ran high as jingoism ran rampant. Bush and Giuliani were at the height of their popularity. And amidst this tumult, the New York Yankees made the World Series, suddenly cast in the entirely unfamiliar role of the team most of America actually wanted to win. The foils from the National League were the upstart Arizona Diamondbacks. Two friends and I split Diamondbacks’ season tickets since their inception, in 1998. My office at the time was located almost walking distance to the stadium, and I took in 25 games each year, rooting on the 1-2 punch of Randy Johnson and Curt Schilling. Toward the end of the regular season, my buddies and I were offered the chance to purchase playoff tickets, and we did so. My pal Pete was the actual account holder of record, so the tickets were mailed to his house. But he never got them. It’s a snafu that remains unexplained even now, but best guess is that they were mailed incorrectly, they were stolen from his porch, or he lost them. A few days before the first playoff game, we realized that we never received the tickets, and had to go down to the Diamondbacks ticket office to sort it out. Somewhat skeptically, they printed us a new set using the in-office dot matrix printer. Satisfied that we had solve the issue, we split the tickets and proceeded to enjoy the Division Series and League Championship Series. The Diamondbacks won both, and all of a sudden the World Series was coming to town! A chance at a championship – ANY championship – is pretty damn rare in Arizona, as the Suns have been to two finals since 1968, The Cardinals have been to just one Super Bowl (and that was well after this series of calamities), and the Coyotes have never made it out of the first round of the NHL playoffs. With that historic lack of success, this was a big deal, especially squaring off against sporting royalty like the Yankees. I attended Game 1 of the Series, and it was fantastic. Saying the crowd is “electric” is a well-worn descriptor, but its commonality makes it no less apt. It was amazing. The Diamondbacks put the hurt on the Yankees early in the series, and it looked like it would be a short, uneventful matchup. But then the Yankees, buoyed by the extraordinary emotion in New York fueled by 9/11, rallied back and won two extra-innings games at home, sending the series to a decisive Game 7, in Phoenix. I won a contentious three-way card draw against my friends, and got our two seats to the biggest game in Arizona history. There was only one person in the world I was going to bring with me to that game….my brother-in-law Alfonso. Al grew up in Yonkers, New York and moved to Arizona in third grade. By fourth grade, we were best friends and pretty much stayed that way for the next 23 years. So much so, that Al married my wife’s sister, and thus we became brothers-in-law. I’ll just digress here for a moment to tell you that having your best friend as your brother-in-law is a great gig. If you can engineer such a thing, I highly recommend it, as it makes family gatherings far more entertaining. After Al married my wife’s sister, the four of us (and often 2-3 other couples) spent a TON of time together. Parties. Dinner clubs. Card games. Concerts. This was in the days when nobody had kids, or if they did (like me), they were babies, and you could just bring them everywhere. Good times and some of the best memories of my life. 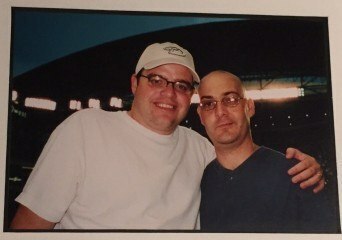 But in 2000, Al (we were both then 32) was diagnosed with brain cancer. It’s a different story, but that diagnosis is what prompted me to quit my job and start my own company. By the time the World Series came around 15 months or so later, Al had been through several tricky surgeries and rehabilitations. He was a little wobbly, and had mostly lost the power of speech. A high school baseball player (and a good one) Al and the Yankees had a love affair. Super fan, in every way. So, there was no question he was coming with me to Game 7. He was crazy about the Yankees, and had been through so, so, so much. Remember that this was the first big sporting event in the USA after the bombings, so security was very, very tight. Tons of extra law enforcement everywhere around the stadium. Lots of bag searches, and the like. They even welded shut the manhole covers in the surrounding area. We get to our seats, and in the middle of the first inning Al says he’s going to grab a cigarette (don’t judge. a LOT of people smoked then, including me). I said I was going to stay put to watch the Diamondbacks bat, but I knew where he was headed – to the smoking area outside the left field entrance. I watch the bottom of the first. And the top of the second. And the bottom of the second. And the top of the third. Still no Al. Longest cigarette ever? And during the World Series? Begrudgingly, I decided to investigate. Off to left field I went. As I approached the glass door to the smoking section, I spied Al being interrogated by a sheriff’s deputy. “You’re going to be in them too, in a second,” shouts the deputy. “These tickets are fake, and this guy is super shifty and won’t even answer questions!” He gets on the radio and calls for backup. I explained that the tickets weren’t fake, but that indeed they DID look different. They were small, not big. They didn’t have the fancy World Series logo and hologram on them. They were dot matrix reprints, not the collectible souvenir tickets that everyone else in the stadium had. I further detailed that Al was UNABLE to answer questions, due to the series of brain surgeries and all, but it was not a fruitful conversation. The deputy stated plainly (and not graciously) that all law enforcement were instructed to detain any holders of counterfeit tickets because of rumors that terrorists might use them to penetrate the stadium security. Within two minutes, I was handcuffed behind my back and joined Al up against the cold exterior of Bank One Ballpark, while Game 7 of the World Series was being played just inside. We were in handcuffs for 4 innings. Eventually, after more than an hour, it worked. Someone from the ticket office came over, took one look at the tickets and said they were fine, and we were unshackled and sent on our way. Stunned by the entire affair, we shuffled back to our seats (after procuring a MUCH-needed beer on the way) by the 7th inning stretch, when the game was tied 1-1. The next forty-five minutes or so are some of the most legendary and memorable in baseball history, as the Yankees went ahead 2-1, but the Diamondbacks scored twice in the bottom of the ninth off of Mariano Rivera, and won the World Series amidst absolute pandemonium in the stadium. When Luis Gonzalez blooped a hit to win the game and the series and defeat his beloved Yankees, Al just turned to me and gave me a sad shake of the head, and a little smirk. Sports Illustrated named the contest the best post-season game of the decade. I was delighted that the D-backs had won, and the scene on the streets of downtown Phoenix afterwards was like nothing I’d ever seen (and haven’t seen since). But a day or so later, that jubilation wore off and I became downright angry about the handcuffs incident. I wrote a long letter to the Diamondbacks, and another to the Sheriff’s Office, asking for an explanation and a refund on our World Series tickets. Nothing. Not even an acknowledgement, and certainly no apology or action. And as I fly out of Kansas City during their World Series, I realize that if I just had a smartphone (and Twitter and Facebook) back then, not only would I have been out of handcuffs quickly, but a public apology would have followed right behind. We take the ability to get real-time answers, real-time help, and real-time apologies for granted, because they are the norm today. But it wasn’t the norm in 2001 – the year the Diamondbacks won it all, and me and Al missed half of it.